Over the past 61 years, I can’t tell you how much fun it has been to play music over the years, and the countless number of people I have met through personal contact, over the phone, and through the internet all of whom I can call friends. See the separate partial list of folks I’ve played with or whom I’ve associated with just through music. The first songs that I can remember hearing on records or radio at home were Roly Poly, I Want To Be A Cowboy’s Sweetheart, Chime Bells, Detour, I'll Hold You In My Heart, etc. My late brother Jack was a big fan of Hank Snow, and we had lots of 78s of ole Hank for a wind-up Victrola. 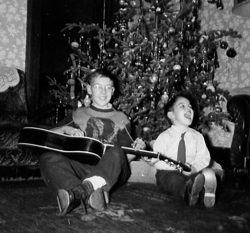 My introduction to playing Hawaiian guitar started when I was in Grade 7 at Gorsebrook Junior High and a class buddy by the name of Bill Baker said one day, “George, I’m taking Hawaiian guitar lessons at the Halifax Hawaiian Studios, it’s fun, you should come”. That year, 1947, my father was a very ill man as a result of several strokes and extremely high blood pressure, which finally took him at age 57 in 1953. Because of this ill health since being medically discharged from the army in 1946, we had little money coming in. To ask my mother for the $1 per week was something she didn’t have, but somehow I convinced her and started taking lessons. 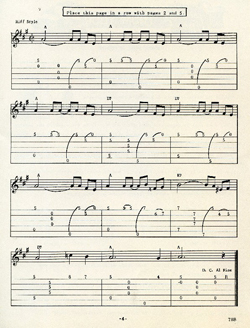 Hawaiian guitar was still quite popular at that time (before rock ‘n’ roll hit) with many schools making a good buck on teaching it. Halifax Hawaiian Studios (HHS) was owned by a Fred Shebib and my teachers were the late Frank Martell and Roy Armstrong. All the kids thought Roy was a nifty guy, as he could make guitar amplifiers. 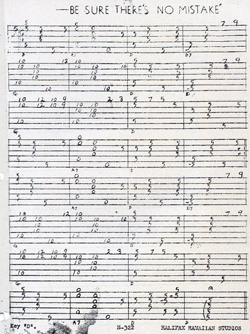 While one could learn notation, the “number system”, which today we call “TAB”, was popular and the Oahu method was used by many schools including the HHS. 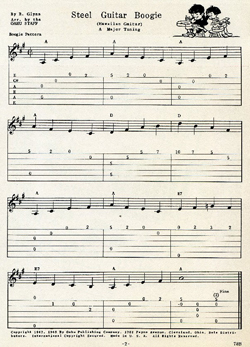 See the Oahu tab “Steel Guitar Boogie” and “Be Sure There’s No Mistake” below. For my $1 per week, I got the loan of a used Stella guitar, a thumb pick, two finger picks and a bar and was supplied with a piece of music. Now, many people started and many dropped out, so I wasn’t given a new guitar until I proved to be a permanent student. 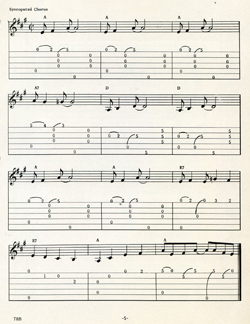 I really liked it, and was usually ahead of playing more than my lesson of the week. Since I stuck with it, I eventually got a new Stella guitar as promised. However, if you took the 2nd year “advanced”, you could trade in your Stella on an S. S. Stewart “concert size” guitar, which I did. Looking back, I can’t say the 2nd year was any more “advanced”, they just got another $1 per week for the second year. 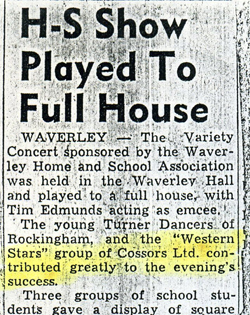 My first concert was at Gorsebrook school when I played “Waltz Exercise” at some festivity in the gym. I remember Arthur Fordham played classical fiddle ahead of me and I was scared stiff. In the gym, people could hardly hear my acoustic guitar, but I got a big hand, I do remember. My buddy Bill Baker had long dropped out of taking lessons. I met someone taking lessons also who, to this day, is still a good friend. This was Bill “Hank” Fay, who lived on Edward St., basically in my neighbourhood. The lessons were not private, ten or twelve kids all sat around the room, each playing a different piece of music!!!!!! In 1952, I bought a Rickenbacker electric Hawaiian guitar and matching Gaylord amplifier. I thought I was king. While I sold the guitar and amplifier to a work colleague in 1962 in Montreal to where I had moved in 1960, I was fortunate to get back my “first electric guitar” when just by chance I met the chap on a street in Toronto in 1982. He was just going to put it in a garage sale that coming weekend. Happiness was getting my rickety Rickenbacker back!!! He apologized profusely for not knowing whatever became of the amplifier. 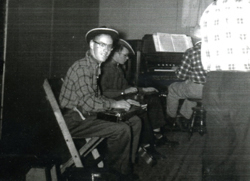 In 1953, I bought a nifty Gibson Console Grand double 8 from a Carl Dalrymple. I always remembered that name but never heard of him again until 2001. As we musicians get older, we get a bit sentimental/nostalgic about the guitars we own(ed). 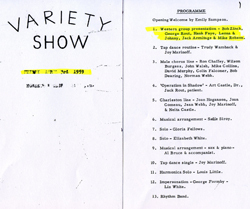 Around year 2001, I decided to search out Carl and wrote a letter to Fred Isenor, whose name I had heard over the years. 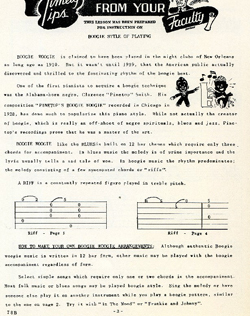 He was not only knowledgeable in music, but also took Hawaiian guitar lessons the same time as I, albeit he lived in Lantz. 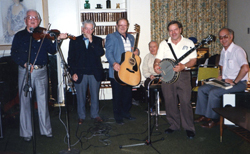 He sent back a picture of his band, the Nova Scotia Ramblers with Carl playing in it. Carl and I immediately connected again and I’ve been back to NS twice to visit both Carl, Fred and many others I’ve come to know. Carl told me that he purchased this Gibson from the late Mervyn Maxwell, who purchased it originally from Neiforth Radio in Dartmouth. In 1955, I started working for Cossor Canada, the Canadian subsidiary of an old British electronics company, A. C. Cossor Ltd. 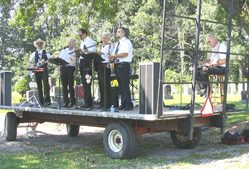 There were a few staffers who played music, which came about when we had a Cossor Picnic. 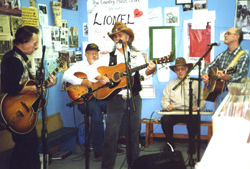 We decided to form a band, loosely called the Cossor Band, but outside of work, we were called the Western Stars. It consisted mostly of employees such as Jack Armitage, Leona Girroir, Nita Castle, Bob Zinck, Bernie Davis, Mary MacKay, Mike Robson and myself, with some non-Cossor people such as Bill “Hank” Fay, Johnny Markey and Gloria Fellows. I lived in Montreal from 1960 to 1977. 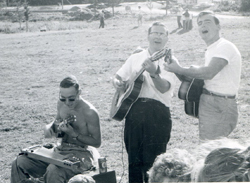 In the early 60s, I met a group of chaps who called themselves the Country Drifters. 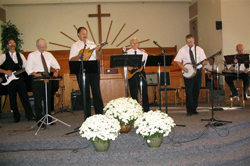 While we got together a number of times, most of the guys were married with young children and that limited their gig playing and practicing. 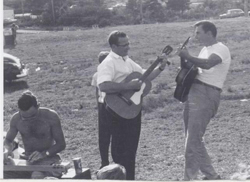 In 1963, while working for Sperry Gyroscope, I met a chap at work who played a Martin guitar. Len Tremblay became my father-in-law. We played considerably at house parties and a few commercial ventures of business friends. We were joined by Dave MacLean, who worked for the Montreal Star and we played different venues. One I remember in particular was several times at the Howick Curling Club. In 1975, then working for Montreal Engineering (Monenco), they moved the family to St. Catharines. Here, I met many folks interested in jamming. 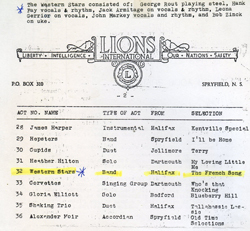 Rita Bradley had a Peninsula Country Music club which met weekly at Governor Simcoe School, where folks would come to jam. 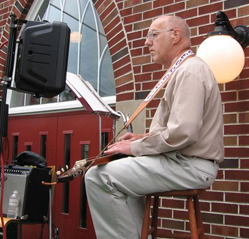 I’ve played with many, many folks at old folks homes, etc. In 1981, the recession resulted in many of us Monenco staff being laid off. With little work around Niagara, I sought out work in the Toronto area. To make life less stressful from traveling daily from Niagara to Toronto, I decided to stay during the week and come home on the weekends. Here again, I ended up meeting many folks who played music. In one band, I don’t think we had a name, we played every month for 9 years without fail (except for vacations) at the Princess Margaret Lodge. 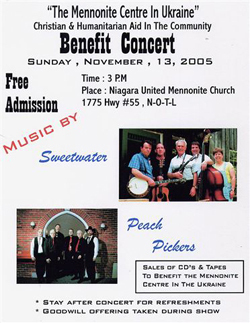 Headed by Noel Deveau and Jim Connors, there was myself, the late “Father” Anthony on fiddle, Mando Deveau on banjo, and the late brother Tom on a small drum set. 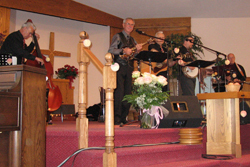 Along with the Lodge, we played at numerous nursing homes such as Parkdale, Fudger House, etc. 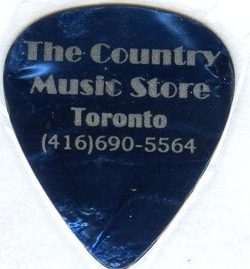 I came to know of a Saturday afternoon jam session at Ossie Branscombe’s (now defunct) Country Music Store on the Danforth. 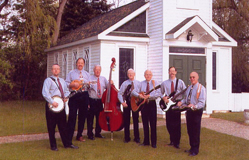 The store was the ultimate social get-together to many who’s who in Canadian country, bluegrass and Celtic music. It was packed every Saturday with pickers and people listening, and it was here where I made some of the most fun musical contacts, i.e. 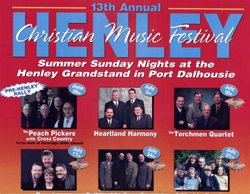 the late Joe King, Lionel Pelletier, Gilles Mazerolle, Al Altena, etc. MTO moved its offices from Downsview to St. Catharines in the late 90s, and I was back here. I reunited with some old music friends and met new ones. In recent times, I’ve been playing considerably at old folks homes, Legions, Canadian Corps, etc. See musical Photos Page. 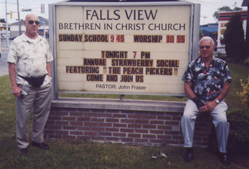 In 2002, Eric Goerz and John Harder, the two original Lincoln County Peach Pickers of the late 40s/early 50s, mentioned to me that they were thinking of getting together with some musicians for a project connected with their Mennonite church. 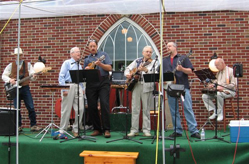 The group, simply called the Peach Pickers, was formed in 2002, with Eric as leader, on vocals and rhythm guitar, John Harder on Omnichord and vocals, Karl Goerz on vocals, banjo and guitar, Al Teichroeb on vocals and mandolin, Abe Koop on bass and myself on Dobro. 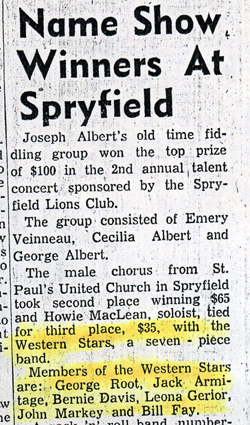 In due course, Abe moved out west and was replaced by Vic Goertzen on acoustic bass and Ed Enns on electric bass, depending upon Ed’s work schedule. 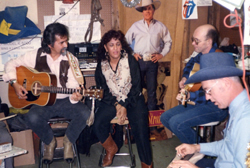 Three successful CDs were produced. 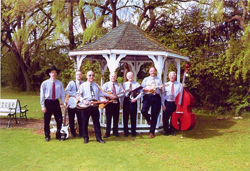 While the band is dormant at present, you can see the website at http://thepeachpickers.com . 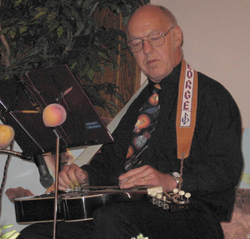 My association with the guys has to be one of the highlights of my involvement in playing Dobro and steel guitar. 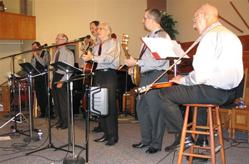 For more interesting photos, check out the MUSIC PICTURES PAGE. Click on the MP3 buttons to hear the tunes. Enjoy!! If you wish a copy, they’re $12 each, postage included. Please send an email for payment instructions.